INVENTING THE CARTERS: Harriott (right), Burger and Jarrett sharing scenes from the play. IF nothing else, Something Fishy delivers further proof that family life gets messy, marriage is anything but easy and it takes real work and commitment to create mutually beneficial relationships. 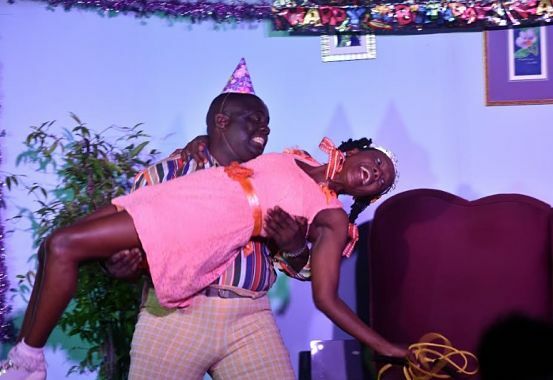 On the upside, this domestic comedy-drama, penned by veteran actress-turned-playwright Angela Jarrett and helmed by veteran actor-turned-stage director Andrew Brodber, has fireworks, strong performances and loads of humour that elicit the big laughs. On the downside, some scenes are perilously overlong and as a result the pace sometimes drags and the action occasionally sags. But Something Fishy is satisfactorily entertaining and insightful and will prompt couples whose marriages are on the rocks to take a closer look at the possible factors lurking behind the cracks in their once perfect unions. Impatient mechanic George (Wesley ‘Burgerman’ Burger) and fragile schoolteacher Pam (Karen ‘Tiny Winey’ Harriott) are a middle-class couple desperate to have their first child. But in spite of numerous trips to the doctor and other alternatives, Pam is unable to conceive, yet the doctors tell her she is “perfect”; nothing is wrong with her reproductive system. Is George the problem? He refuses to take the blame. He shies away from medical check-ups and refuses to drink the chainey roots his wife has bought for him, for “enhancement” purposes. Something’s got to give. Consequently, they bicker non-stop. With her mom miles away, Pam has no one to turn to but nosy neighbor Juliet (Jodian Findley, hilarious), a firecracker with a peppery tongue and a serious begging addiction that gets on George’s nerves. But nothing can prepare George for the arrival of Lorna Lannaman (Jarrett, with great comedic timing), a 10-year-old big baby who moves in after Auntie Pam adopts her from the Comfort Children’s Home. In no time, Lorna takes over, torturing Uncle Georgie, her play-time donkey, ‘blackmailing’ him when she catches him doing something bad behind Pam’s back. Lorna must have her way and her antics will leave you in stitches. Pam’s dream is for everyone to get along and live as one big happy family but what plays out is a series of events that puts an explosive spin on domestic bliss.